Engaging young people in politics is an important pillar to strengthening democracies. With an estimated 1.2 billion people aged from 15 to 24 worldwide, justice and democratic legitimacy demand more than a token youth presence in parliament. People between the ages of 20 and 44 represent 57 per cent of the world’s voting age population but only 26 per cent of the world’s MPs. 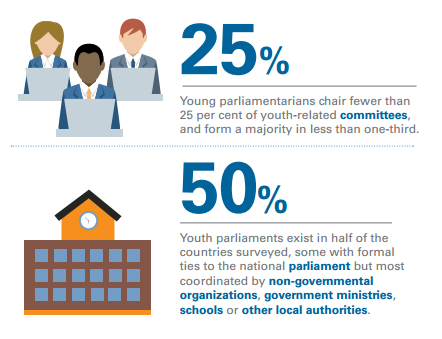 The new IPU report Youth participation in national parliaments 2016 was launched on March 16, 2016 during the IPU Global Conference of Young Parliamentarians in Zambia. 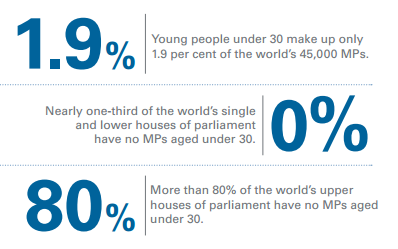 The report reveals that only 1.9 per cent of the world’s 45,000 parliamentarians are under 30. The level shows almost no improvement on figures from a previous IPU study conducted in 2014. Nearly a third of single or lower houses of parliament and nearly 80 per cent of upper houses surveyed do not have a single Member of Parliament (MP) below the age of 30. Only four countries - Sweden, Ecuador, Finland and Norway – have 10 per cent or more MPs under 30. The overall figures for young MPs rise to 14.2 per cent for those under 40, and 26 per cent for those under 45. In all age groups, the figures fall far short of the corresponding numbers for their share of the population. People aged 20-44 make up 57 per cent of the world’s voters, according to UN figures. Click here to know more and to download the report.